This is really a bit of an update. In autumn 2013 I planted some small daffs and crocus in the lawn, as well as some bigger ones, and now, in their third spring, I can make a decent assessment of how they have done. 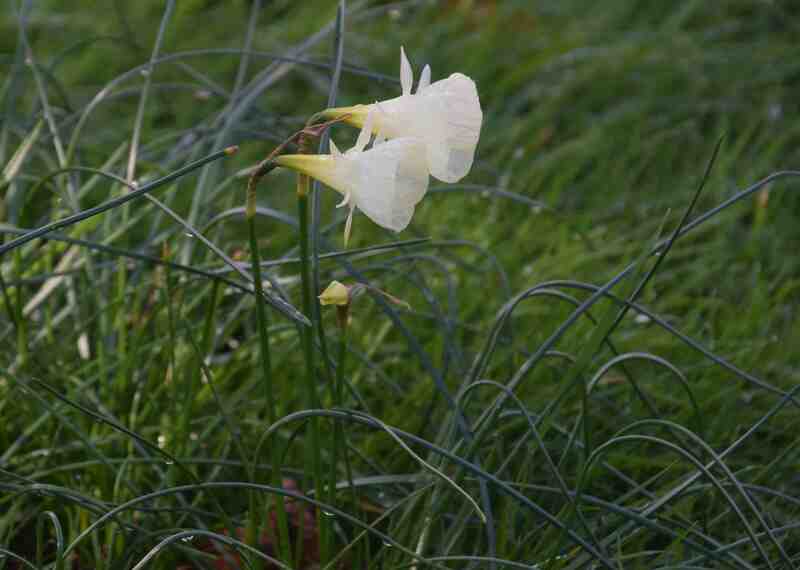 The narcissus I was most excited about was the relatively new ‘Spoirot’ which is like a hoop petticoat daffodil but in pure, creamy white. Although new to the trade it was bred in the 1980s by Rod Barwick in Tasmania and was given an RHS Award of Garden Merit after trial at Wisley where it was found to be showy and vigorous, producing 180 flowers from ten bulbs after three years of growth. My plants are in grass and, especially this year when the grass is longer than I would like because of the mild winter, they have not increased anywhere near as much. Part of its charm is that the bulbs produce a succession of flowers over a very long time and the first flowers opened several weeks ago and I will expect more for at least another month. Though pretty in the garden they are nice for picking too, with some cyclamen and snowdrops, and the flowers are carried on stems about 20cm high. The leaves are very thin and grasslike. If you still have to buy your seeds Plants of Distinction have an offer all this week with 20% off all peas (including sweet peas) and beans. The daffodils are very pretty and delicate and would be a beautiful companion plant with snowdrops. I have a snowdrop lawn in which I grow crocus tommasinianus with the snowdrops(Galanthus nivalis). Mary’s snowdrop lawn is gorgeous. I was admiring it on Friday. A big pool of snowdrops, crocus and wee narcissi.